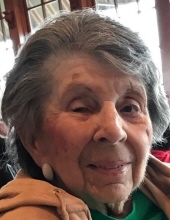 Gloria J. Albanese (nee Fitzpatrick), 88, died September 24, 2018 at the Jersey Shore Medical Center in Neptune. Born in Brooklyn, N.Y., she lived in Jersey City before moving to Brick 19 years ago. In 1998 she retired after 29 years a service from the Hudson County Courthouse in Jersey City where she worked as an elevator operator and later an administrative assistant. She was the beloved wife of the late Anthony J., the cherished mother of Susan A. Albanese, and Carol Mack and her husband Patrick, the adored grandmother of Erik DeCeuster, Joseph Mack, Ryan DeCeuster, Troy DeCeuster, Amy Mack and Andrea Mack, and the great grandmother of Tyler Mack, the loving sister of the late Patricia “Betty” Ciavolella and her late husband Benny, the dear aunt of Nancy Sessa and Gloria Swanson. She will also be greatly missed by her numerous great nieces and nephews. The funeral will be from the Parow Funeral Home, 185 Ridge Road, North Arlington on Thursday, September 27, at 10 A.M. thence to Our Lady Queen of Peace Church, North Arlington for the Funeral Mass at 11 A.M. A private cremation will follow. Visitation will be at the Funeral Home on Wednesday 4 to 8 P.M.
To send flowers or a remembrance gift to the family of Gloria J. Albanese, please visit our Tribute Store. "Email Address" would like to share the life celebration of Gloria J. Albanese. Click on the "link" to go to share a favorite memory or leave a condolence message for the family.